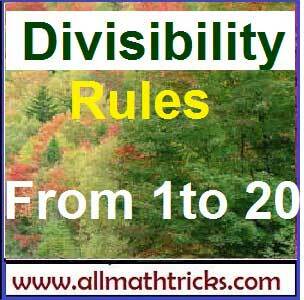 Here given divisibility rules for the numbers from 1 to 20. Divisible by 4 : A number is divisible by 4, if the number formed with its last two digits is divisible by 4. Divisible by 8 : A number is divisible by 8, if the number formed with its last three digits is divisible by 8. Divisible by 16 : A number is divisible by 16, if the number formed with its last three digits is divisible by 16. 1.Check divisibility by 2, 4, 8 & 16 of the number 413984. The lost digit of the above number is 4. So this number is divisible by 2. Now take lost three digits i. e 984 and 984 divisible by 8 ( 984/8 = 123). So this number is divisible by 8. Take lost four digits i. e 3984 and 3984 divisible by 16 ( 3984/16 = 249). So this number is divisible by 16. 2. Check divisibility by 2, 4, 8 & 16 of the number 24589436. The lost digit of the above number is 6. So this number is divisible by 2. Now take lost three digits i. e 436 and 436 not divisible by 8 ( 436/8 = reminder 4). So this number is not divisible by 8. Take lost four digits i. e 9436 and 9436 is not divisible by 16 ( 9436/16 = reminder 4). So this number is not divisible by 16. All such numbers the sum of whose digits are divisible by 3 are divisible by 3. In the same rule also applicable for 9 also i.e the sum of digits of a number are divisible by 9 then it is divisible by 9. 1.Check divisibility by 3 & 9 of the number 25498644. So here 42 is divisible by 3 and not divisible by 9 . So given number is also divisible by 3 and not divisible by 9. 1.Check divisibility by 3 & 9 of the number 232911. So here 18 is divisible by 3 and also divisible by 9 . So given number is also divisible by 3 and 9. Any number end with 0 or 5 then it is divisible by 5. The lost digit of the given number is “0” . So it is divisible by 5. 2.Check divisibility by 5 of the number 265474585. The lost digit of the given number is “5” . So it is divisible by 5. A number is divisible by 6, if it is simultaneously divisible by 2 and 3. 1.Check divisibility by 6 of the number 357282918. The lost digit of the above given number is 8. So this number is divisible by 2. The sum of all digits in a given number = 3+5+7+2+8+2+9+1+8 = 45 and it is divisible by 3 (45/3=15). The given number is divisible by 2 and 3. So it is also divisible by 6. 2.Check divisibility by 6 for the number 4875614. The lost digit of the above given number is 4. So this number is divisible by 2. The given number is divisible by 2 and not divisible by 3. So the given number is not divisible by 6. We use oscillator (– 2) for divisibility test. step 1 : Separate unit place from the given number and multiplied by “-2” for unit digit place ( 2 x -2 = -4) . This product is to be add for remaining number [ 3973 + (-4) = 3969]. 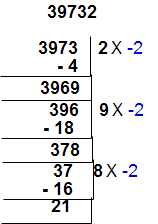 step 2 : Separate unit place from 3969 and multiplied by “-2” for unit digit place ( 9 x -2 = -18) . This product is to be add for remaining number [ 396 + (-18) = 378]. step 3 : Separate unit place from 378 and multiplied by “-2” for unit digit place ( 8 x -2 = -16) . This product is to be add for remaining number [ 37 + (-16) = 21]. A number is divisible by 11, if the difference of the the sum of the digits in the odd places and the sum of the digits in the even places is zero or is divisible by 11. 1.Check the divisibility of a number 2846767 by 11. The difference of the sum of odd and even places is ” 0″ . So the number 2846767 is divisible by 11. 2.Check the divisibility of a number 964712435 by 11. The difference of the sum of odd and even places is ” 5″ . So the number 964712435 is not divisible by 11. We use oscillator (+4) for divisibility test of 13.
step 1 : Separate unit place from the given number and multiplied by ” 4″ for unit digit place ( 1 x 4 = 4) . This product is to be add for remaining number [ 763 + (4) = 767 ]. step 2 : Separate unit place from 763 and multiplied by “4” for unit digit place ( 7 x 4 = 28) . This product is to be add for remaining number [ 76 + (28) = 104]. We use oscillator (-5) for divisibility test of 17.
step 1 : Separate unit place from the given number and multiplied by ” -5″ for unit digit place ( -5 x 5 = -25) . This product is to be add for remaining number [ 152566 + (-25) = 152541]. 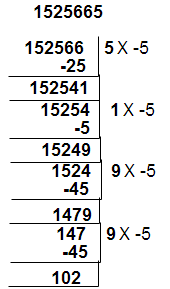 step 2 : Separate unit place from 152541 and multiplied by “-5” for unit digit place ( -5 x 1 = -5) . This product is to be add for remaining number [ 15254 + (-5) = 15249 ]. step 3 : Separate unit place from 16249 and multiplied by “-5” for unit digit place ( -5 x 9 = -45) . This product is to be add for remaining number [ 1524 + (-45) = 1479]. step 4 : Separate unit place from 1579 and multiplied by “-5” for unit digit place ( -5 x 9 = -45) . This product is to be add for remaining number [ 147 + (-45) = 102]. We use oscillator (+2) for divisibility test of 19.
step 1 : Separate unit place from the given number and multiplied by ” 2″ for unit digit place ( 2 x 3 = 6) . This product is to be add for remaining number [ 11204 + (6) = 11210 ]. step 2 : Separate unit place from 11210 and multiplied by “2” for unit digit place ( 2 x 0 = 0) . This product is to be add for remaining number [ 1121 + (0) = 1121]. step 3 : Separate unit place from 1121 and multiplied by “2” for unit digit place ( 2 x 1 = 2) . This product is to be add for remaining number [ 112 + (2) = 114].